© Van de Velde et al. ; Licensee Bentham Open. Noninvasive measurement of cutaneous tissue oxygenation using near-infrared spectroscopy (NIRS) has become common in peri-operative care. Following institution of peripheral nerve blocks, neurovascular alterations in the blocked region have been described. The primary aim of this study encompassed the assessment of the influence of a popliteal block on changes in regional oxygen saturation (SrO2), and the location of most prominent changes. We conducted a prospective randomised controlled trial. Hundred twenty patients who received a popliteal block for foot surgery were included. Popliteal block was performed under echographic guidance. The patients were randomized in 3 groups according to the location of the SrO2 electrodes on the legs. Bilateral SrO2 measurements were performed simultaneously. SrO2 in the operated leg and in the control leg was measured at baseline and 1, 5, 10, 15, and 30 minutes after the perineural injection. We quantified the evolution in SrO2 by calculating over time the differences in SrO2 values between the operated and control leg (=ΔSrO2). At 30 minutes, ΔSrO2 increased significantly (p<0.05) at the plantar side of the foot (11.3% ± 2.9%), above the ankle (4.9% ± 1.3%) and the popliteal fossa (3.6% ± 1.2%). 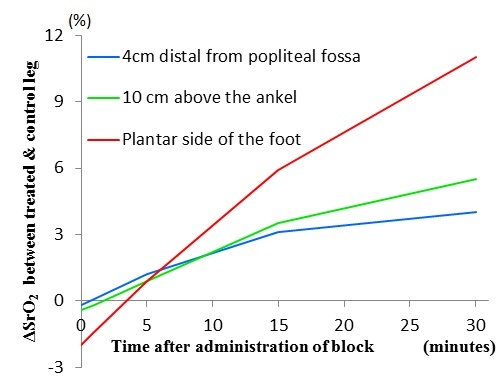 At 30 minutes after institution of the popliteal block, ΔSrO2 was most prominent at the plantar side of the foot as compared with measurement performed above the ankle or under the knee. Keywords: INVOS, Locoregional anaesthesia, Neurovascular effects, NIRS, Popliteal block, Tissue oxygen saturation. Peripheral neural blockade is a widely used technique in perioperative care. Besides the desired analgesic effect, perineural infiltration of local anaesthetics induces a number of neurovascular changes. Clinically, patients experience a distinctive albeit subjective sensation of warmth and dilation of the superficial veins. Venodilation in the arm in patients who received an axillary block was demonstrated by echography , and alterations in the ipsilateral brachial artery after brachial plexus block was reported using pulsed wave Doppler ultrasound . Increased local blood flow and increased skin temperature occur as a result of sympathetic nerve blockade and these neurovascular changes and the resulting local vasodilatation are associated with successful peripheral nerve blockade [3, 4]. Noninvasive measurement of cutaneous tissue oxygenation using near-infrared spectroscopy (NIRS) has become common in cardiovascular and plastic surgery [5, 6]. NIRS quantifies the differing absorption and reflection of near-infrared light by human tissues, which provides a tissue-oxygen saturation index . What are the alterations in tissue oxygenation caused by regional anaesthesia and peripheral nerve blocks? Is it possible to detect these changes with the available NIRS devices? Tighe et al. demonstrated significant differences in regional oxygen saturation (=SrO2) values in blocked vs. control limbs after cervical paravertebral and infraclavicular blocks in a small group of patients . The primary aim of this study is to assess the influence of a popliteal block on changes in SrO2 as compared to the contralateral lower extremity. One Hundred twenty patients between 18 and 65 years of age who received a popliteal block for foot surgery were included. All patients underwent hallux valgus repair with a similar technique and surgery was performed by the same orthopaedic surgeon. The study was accepted by the local ethical committee (2011.55). All patients were enrolled after obtaining written informed consent. Exclusion criteria included contraindication to peripheral nerve block, history of peripheral nerve injury or neuropathy of the affected region, peripheral vascular disease or surgery, morbid obesity defined as body mass index (BMI) greater than 40, or infection or cutaneous lesion in the monitored region. The presence of sensory block in the peroneal and tibial nerve area was ascertained using the pinprick method 30 minutes after injection of local anaesthetic. If no full sensory block was confirmed, the patient was excluded from further analysis and its randomisation number was returned to the sealed card pool. The presence of motor block was not assessed before surgery. A successful block was defined as a complete sensory block of both branches of the sciatic popliteal nerve within 30 minutes and the absence of a response to surgical stimulation. All patients received general anaesthesia according to a standardised protocol, which did not allow the administration of opiates. Failure of surgical block was considered as an exclusion criterion. Popliteal block was performed under echographic guidance. A mixture of Levobupivacaine (Levobupivacaine®, Baxter Healthcare S.A., Ireland) 0.5% 30 cc and clonidine 150 microgram (Catapressan®, Boehringer Ingelheim, Spain) was injected perineurally. The SrO2 was measured with the INVOS® system (Somanetics, Covidien, USA). SrO2 measurements were performed simultaneously in both legs to rule out possible systemic effects. The influence of the popliteal block on SrO2 evolution could be demonstrated and compared to the SrO2 of the contralateral leg without locoregional block. The patients were randomized in 3 groups according to the location of the SrO2 electrodes on the legs. The electrodes were bilaterally applied at 4 cm distal from the popliteal fossa (UK, n=40) in group 1, at 10cm above the ankle (AA, n=40) in group 2 and at the plantar side of the foot (FO, n=40) in group 3. SrO2 in the operated leg and in the control leg was measured at baseline (moment of performing the block) and 1, 5, 10, 15, and 30 minutes after the perineural injection. We quantified the evolution in SrO2 by calculating over time the differences in SrO2 values between the operated and control leg (=ΔSrO2). ΔSrO2 expressed the absolute change in SrO2 in the leg where a popliteal block was performed compared with the non-operated leg. Statistical analyses were performed using Statistical Analysis Software (SAS) (version 9.2, Cary, NC, USA). Variables are reported as mean +/- standard deviation (SD). The Wilcoxon paired sample test was used to compare the different variables between groups. The Fisher Exact test was used for comparisons between categorical variables. All tests were performed two-tailed. Statistical significance was defined as p<0.05. The sample size calculation was based on pilot data measuring a mean(SD) ΔSrO2 at 30 minutes at the plantar side of the foot of 11.2%(2.6%). Assuming a standard deviation of 2.6% in all groups, α= 5%, β=5% and a significance level of 2%, a T-test based on the difference between independent means showed that the minimal required sample size was 38 patients in each group. A total of 129 patients were included in the study, 9 patients were excluded because of failed sensory block. 40 patients were included in each group. Demographic characteristics (gender, age and BMI) were well balanced between the three groups. The evolution of ΔSrO2 was evaluated in the three groups. ΔSrO2 significantly increased over time, F(1,87)=29.85, p<0.0001, but this linear increase levelled out at 30 minutes, F(1,264)=5.69, p=0.02 (as indicated by a small negative effect for the quadratic effect of time). More importantly however, the ΔSrO2 was different in the three groups, F(2,264)=6.51, p=0.0017 (group x time interaction). Fig. (1) shows that, although the ΔSrO2 significantly increased over time in all groups, this increase was significantly stronger in the group with measurement of SrO2 on the plantar side of the foot. Post-hoc pairwise comparisons indeed confirmed that the linear increase over time is stronger in the group with SrO2 measurement electrodes on the plantar side of the foot. The two other groups showed a similar, statistically significant increase in ΔSrO2, which was less pronounced than the group with plantar SrO2 measurement. (AA vs. FO, F(1,264)=7.41, p=0.0069; UK vs. FO, F(1,264)=11.687, p=0.0007; AA vs. UK, F(1,264)=0.48, p=0.4871). At 30 minutes ΔSrO2 was 3.6 ± 1.2 for group 1 (=UK), 4.9 ± 1.3 for group 2 (=AA) and 11.3 ± 2.9 for group 3 (=FO). Evolution of difference in SrO2 between operated and control leg (= ΔSrO2). Comparison of three groups with different location of SrO2 measurement electrodes. The error bars represent one standard deviation of uncertainty. The NIRS sensor offers the ability to detect changes in tissue oxygen saturation. This value can change based on alterations in either oxygen consumption or oxygen delivery. NIRS is unable to distinguish between these causes. The exact mechanism of increased perfusion and a rise in SrO2 after peripheral neural blockade is uncertain. The neurovascular alterations after popliteal block could influence regional flow or peripheral oxygen consumption. The NIRS probe emits light with several wavelengths in the 700 to 850 nm interval and measures the reflected light mainly from a predefined depth . NIRS utilizes a narrower spectrum of wavelengths than pulse oximetry, which penetrate deeper into the tissue . Complex physical models then allow the measurement of relative concentrations of oxy- and deoxyhaemoglobin . Yet, given the large number of assumptions and approximations in the theoretical basis of NIRS, one may assume trends in different NIRS parameters as more robust than discrete values. This is the reason why we chose to work with the evolution of ΔSrO2, rather than with absolute values. The exact depth of penetration (and hence monitoring) seems to be variable. Monitoring depth is technically limited by using light of which the energy does not damage tissues. The main determinants of the returned signal are small vessels of the microcirculation. Variations in thickness of subcutaneous fat can be an important factor of variability. This suggests that differences in vessel density in the subcutaneous region can influence NIRS measurement, and could be another explanation for different NIRS values at the different areas . It is however possible that the evolution of ΔSrO2 is less influenced by this phenomenon. Vessel density is more likely to have impact on the absolute SrO2 values but probably less on the trends. In free flap surgery, NIRS is considered highly suitable for postoperative flap monitoring to detect vascular occlusion . While in flap surgery, the optimal location for placing the sensors is obvious, to what extent NIRS is applicable to detect vascular effects of popliteal block, as well as the optimal location for application of the sensors remains unclear. We investigated the relationship between a popliteal block and subsequent changes in SrO2. After successful peripheral nerve blockade, several vascular changes occur as a result of the blockade of sympathetic nerve fibers . Perfusion index, which is automatically calculated by pulse oximetry and provides an indication of peripheral perfusion at the sensor site (finger), has shown to be a useful method for evaluating axillary or sciatic block in patients scheduled for limb surgery [14, 15]. Sympatholysis following locoregional block also causes augmentation of SrO2 on the ipsilateral side. By simultaneously monitoring SrO2 on the contralateral side and comparing those values with the changes of SrO2 on the interventional side we were able to quantify the absolute difference in SrO2 attributable to the neurovascular effects of the popliteal block. We created 3 groups corresponding to the locations of the NIRS electrodes. Sciatic nerve block results in anaesthesia of the entire lower limb below the knee, including both motor and sensory block, with the exception of a variable strip of skin on the medial leg and foot, which is the area of the saphenous nerve, a branch of the femoral nerve . We placed one NIRS probe at the medial side of the ankle, an area that is normally not influenced by a popliteal block. At the popliteal level we placed another NIRS probe 4 cm beneath the articular line in the middle of the leg, knowing that sensory innervation at that level relies on the posterior cutaneous nerve or the sural nerve [17, 18]. At the plantar level the NIRS probe was placed in the middle of the sole. This region is only innervated by the sciatic nerve and the two subsequent branches. It may be questionable choosing these 3 NIRS probe locations based on the anatomy of sensory innervation of the lower limb, since NIRS would probably not be affected by a regional block that spared the innervating nerve. However it may be probed whether changes in regional perfusion could also be detected in adjacent regions that are not directly affected by the regional block, or if sympatholysis is contained to the blocked region. The sensory innervation at the location of the popliteal probe relies on the posterior cutaneous nerve, a branch of the parasacral plexus, or can be innervated by the sural nerve. Sensory blockade was not tested at this level and concerns may arise about these NIRS measurements as some patients may have been blocked and others not. We also did not test the clinical effect on the popliteal block at the medial side of the ankle, but it is unlikely that this area of the saphenous nerve was blocked by the popliteal nerve block. The ΔSrO2 increases significantly over time in all three groups but to a different extent: the effect of a popliteal block on local neurovascular state, regional perfusion and subsequent SrO2 changes is more pronounced in the group with the plantar location of the NIRS probe. Given the extensive rise of ΔSrO2 in group 3, we concluded that the optimal location for the NIRS electrodes to establish a relation between popliteal block and SrO2 measurement is the plantar side of the foot. The two other groups showed a similar, statistically significant increase in ΔSrO2, but less pronounced than the group with plantar SrO2 measurement. These changes in group 1 and 2 cannot be fully explained as the block has not been tested on the location of the measurement probe. Hypothetically statistical significance could arise if the patients with blocked UK or AA region had pronounced changes and the patients with non-blocked UK or AA region remained at baseline. However, there was a positive ΔSrO2 trend in all individual patients of group 1 and group 2. At 30 minutes mean ΔSrO2 was 3.6 +/- 1.2 for group 1 (=UK) and 4.9 +/- 1.3 for group 2 (=AA). In addition an observed increase in all individual patients suggests a relation between popliteal blockade (either effective or non-effective in the proper region) and NIRS alterations in group 1 and group 2. Regarding the negative ΔSrO2 at time 0 in Fig. (1) we pose the following hypothesis: a blanket was the only measure taken for thermoprotection. The leg where a popliteal block was performed was not covered by a blanket and also had to be disinfected, which made it susceptible for mild temperature loss. It could be that SrO2 was affected by this discrete temperature difference compared with the SrO2 of the non-operated leg, explaining the higher SrO2 in the non-operated leg at time 0 during the performance of the regional block on the contralateral side. This effect could be more pronounced depending on the location: In function of temperature loss: foot>ankle>popliteal fossa and hence in function of SrO2: foot<ankle<popliteal fossa. Following this assumption it appears that ΔSrO2 at time 0 is more negative in FO as compared with AA, and ΔSrO2 at time 0 in AA is smaller as compared with UK. We withhold a relation between popliteal block and ΔSrO2 when the NIRS probe is placed on the plantar side of the foot. This relation is interesting in regard to the positive effects of tissue oxygenation on wound healing and the prevention of chronic pain . As such, while the clinical diagnostic value of NIRS during surgery is limited because foot surgery is conventionally performed under ischemia, our findings show that further research is needed to investigate the extend of ΔSrO2 alteration, its diagnostic value, the level of sympathetic blockade and its relation with postoperative analgesia. Interestingly, our findings indicate that the optimal location to apply the NIRS sensors may not coincide with the sensory innervation zones. As such, if vasomotor effects are to be evaluated, the plantar side of the foot seems the most appropriate location. It is worthwhile to mention here that while the pathophysiological mechanism of complex regional pain syndrome is a multifactorial phenomenon, disturbed vasomotor activity is known to contribute to the pathology. Popliteal block can interrupt the sensory (afferent) arc as well as the motor (efferent) arc of the autonomic reflex circuits. Prevention or disruption of this neurogenic inflammation cascade  may require adequate monitoring, for which properly applied NIRS sensors may be appropriate. At 30 minutes after institution the popliteal block, positive ΔSrO2 was most prominent at the plantar side of the foot. Reynolds TS, Kim KM. Pre-operative regional block anesthesia enhances operative strategy for arteriovenous fistula creation. J Vasc Access 2011; 12: 336-40. Li J, Karmakar MK, Li X, Kwok WH, Ngan Kee WD. Regional hemodynamic changes after an axillary brachial plexus block: a pulsed-wave Doppler ultrasound study. Reg Anesth Pain Med 2012; 37(1): 111-8. Lind L, Eriksson M. Influence of nervous blockade on insulin-mediated glucose uptake in the human forearm. Metabolism 2003; 52(4): 413-7. Kus A, Gurkan Y, Gormus SK, Solak M, Toker K. Usefulness of perfusion index to detect the effect of brachial plexus block. J Clin Monit Comput 2013; 27(3): 325-8. Taillefer MC, Denault AY. Cerebral near-infrared spectroscopy in adult heart surgery: systematic review of its clinical efficacy. Can J Anaesth 2005; 52(1): 79-87. Repez A, Oroszy D, Arnez ZM. Continuous postoperative monitoring of cutaneous free flaps using near infrared spectroscopy. J Plast Reconstr Aesthet Surg 2008; 61(1): 71-7. Mancini DM, Bolinger L, Li H, Kendrick K, Chance B, Wilson JR. Validation of near-infrared spectroscopy in humans. J Appl Physiol 1994; 77(6): 2740-7. Tighe PJ, Elliott CE, Lucas SD, Boezaart AP. Noninvasive tissue oxygen saturation determined by near-infrared spectroscopy following peripheral nerve block. Acta Anaesthesiol Scand 2011; 55(10): 1239-46. Murkin JM, Arango M. Near-infrared spectroscopy as an index of brain and tissue oxygenation. Br J Anaesth 2009; 103(Suppl. 1): i3-i13. Ghosh A, Elwell C, Smith M. Review article: cerebral near-infrared spectroscopy in adults: a work in progress. Anesth Analg 2012; 115(6): 1373-83. Wahr JA, Tremper KK, Samra S, Delpy DT. Near-infrared spectroscopy: theory and applications. J Cardiothorac Vasc Anesth 1996; 10(3): 406-18. Werdehausen R, Braun S, Hermanns H, Freynhagen R, Lipfert P, Stevens MF. Uniform distribution of skin-temperature increase after different regional-anesthesia techniques of the lower extremity. Reg Anesth Pain Med 2007; 32(1): 73-8. Chen Y, Shen Z, Shao Z, Yu P, Wu J. Free flap monitoring using near-infrared spectroscopy: a systemic review. Ann Plast Surg 2016; 76(5): 590-7. Goldman JM, Petterson MT, Kopotic RJ, Barker SJ. Masimo signal extraction pulse oximetry. J Clin Monit Comput 2000; 16(7): 475-83. Galvin EM, Niehof S, Verbrugge SJ, et al. Peripheral flow index is a reliable and early indicator of regional block success. Anesth Analg 2006; 103(1): 239-43. Hamilton PD, Pearce CJ, Pinney SJ, Calder JD. Sciatic nerve blockade: a survey of orthopaedic foot and ankle specialists in North America and the United Kingdom. Foot Ankle Int 2009; 30(12): 1196-201. Murray JM, Derbyshire S, Shields MO. Lower limb blocks. Anaesthesia 2010; 65(Suppl. 1): 57-66. Creech C, Meyr AJ. Techniques of popliteal nerve regional anesthesia. J Foot Ankle Surg 2013; 52(5): 681-5. Bellingham GA, Smith RS, Morley-Forster P, Murkin JM. Use of near infrared spectroscopy to detect impaired tissue oxygen saturation in patients with complex regional pain syndrome type 1. Can J Anaesth 2014; 61(6): 563-70. Bussa M, Guttilla D, Lucia M, Mascaro A, Rinaldi S. Complex regional pain syndrome type I: a comprehensive review. Acta Anaesthesiol Scand 2015; 59(6): 685-97.